Here at National Heating & Air Conditioning, we offer free estimates on all equipment installations. Fill out the form below to get started! Green Cooling is environmentally friendly air-conditioning, which reduces negative impact on the environment. The adverse environmental effects of cooling systems are due to their direct and indirect emissions. To avoid emissions, green cooling equipment utilizes climate-friendly refrigerant and high energy efficiency. 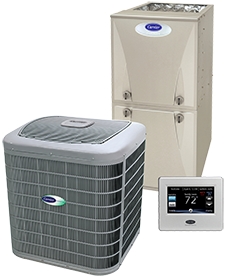 As a Carrier Factory Authorized Dealer, National Heating & Air Conditioning provides a broad range of environmentally responsible, ENERGY STAR rated models to answer the requirements of any size or style of home in the Entire Rogue Valley. While utility costs are unpredictable, National Heating & Air Conditioning provides certain savings with the installation of a hybrid heat system. Whether gas or electric is the most economical fuel source this winter, we’ve got you covered. As a Carrier Factory Authorized Dealer, we specialize in exceptional Hybrid Heat dual fuel systems that take advantage of the most effective and practical solution to your comfort at any given time. You’ll enjoy a wonderfully cool home all summer, cozy warmth all winter, and rewarding cost savings all year long. For ideal temperature control in the Entire Rogue Valley, Hybrid Heating is a perfect choice. 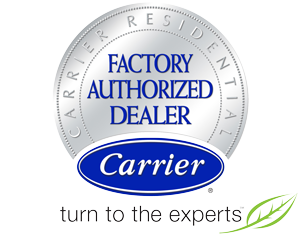 As a Carrier Factory Authorized Dealer, we partner with the leading name in the industry and take advantage of over one hundred years of technical innovations. Since inventing the first air conditioner, Carrier has continued to raise the bar. Whether you’re looking for cooling, heating, or the combination of both, we bring you unprecedented efficiency ratings and the advanced features that offer further cost saving potential. From zoned conditioning to adaptable speed operation, these modern options improve comfort and convenience throughout the home, while preventing the waste of conditioning empty rooms, and allowing longer cycles at lower capacities. Consider the ingenious design of an electric heat pump and enjoy consistent heating and cooling throughout your entire house without the use of fossil fuels. 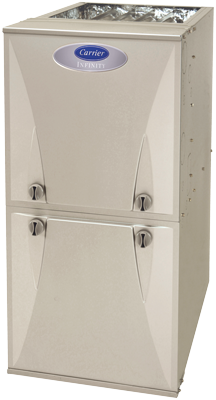 Take advantage of a Hybrid Heat dual fuel system, combining an electric heat pump, gas furnace and Infinity control, for a system with the intelligence to determine the fuel source best suited for the outdoor conditions. With over 30 years of experience, our factory trained, fully-certified technicians bring you home and office comfort services like no other in the Rogue Valley. It's no wonder we've been able to grow our company so expansively through our client referrals. For year round comfort, cost savings, and skilled services, National Heating & Air Conditioning is the right choice throughout the Entire Rogue Valley. We listen to you. And we customize solutions to accommodate your specific requirements. For existing homes and commercial facilities, as well as new construction, our highly trained and experienced technicians provide proficient heating, cooling, and air quality system installation, replacement, maintenance, and repair. Our in-house, custom sheet metal fabrication shop ensures that every project is completed to a strict timetable, with precision calculations, and quality materials. Contact National Heating & Air Conditioning today for more information, convenient scheduling, free estimates, or 24/7 Emergency Service across Medford, Ashland, Central Point, Eagle Point, Phoenix, Talent & Grants Pass, OR and surrounding communities. You’ll always speak to a live, courteous, and knowledgeable member of our team. Our commitment to superior job performance is shared by every member of our team, and creates a friendly, conscientious, and dedicated work environment that carries over to each project we take on. We maintain an A+ rating from the Better Business Bureau, and our technicians are NATE-certified, extensively trained, and ACCA certified. 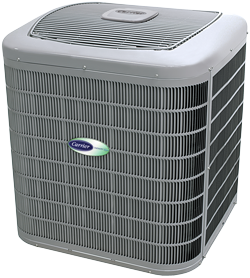 Our experts HVAC technicians are trained to service, repair & install all makes and models of HVAC systems. Whether you furnace breaks down on a holiday or your AC system is leaking a the peak of summer, National Heating & Air Conditioning will be there for you when you need us most. We are Medford, Ashland, Central Point, Eagle Point, Phoenix, Talent, Grants Pass, and surrounding areas premiere heating & cooling company. Call National Heating & Air Conditioning for HVAC repairs, maintenance, and installations! By meeting strict criteria for customer service, business practices, and technician expertise, National Heating & Air Conditioning is distinguished as a Carrier Factory Authorized Dealer, and has been further singled out with the Carrier’s Presidents Award. Since first opening our doors in 1978, National Heating & Air Conditioning has built long-term relationships with multi-generations of customers. Whether you rely on us for residential or commercial HVAC installation, service, or repair, we follow up on every job, because your complete satisfaction is our main objective. Energy efficiency is key when it comes to your HVAC system. A unit that keeps your home or business comfortable, uses less energy and saves money in your pocket every month is what you will get when you install a brand new heating and cooling system. A team member at National Heating & Air Conditioning will go over every option we offer to best fit your needs. Customer satisfaction is our number one goal, quality HVAC service helps us provide that. Contact National Heating & Air Conditioning at (541) 535-4687 to gain more knowledge on all the HVAC installation services we offer. When it comes to HVAC installation, repair & service, there is no better option then choosing National Heating & Air Conditioning. For over 40 years, our team provides Medford & the surrounding areas with dependable, high quality heating & cooling services. Many heating and cooling problems are not do-it-yourself projects. Call National Heating & Air Conditioning at (541) 535-4687 so one of our certified technicians can fix your problem right the first time. Our team is not only knowledgeable but their customer service skills will meet or exceed your expectations. Our highly trained technicians have the skills, experience & expertise necessary to keep your home or business’ HVAC system in peak operating order. Your comfort is our number one priority. Join the long list of our highly satisfied customers today! In the peak of summer – especially in Southern Oregon – your HVAC system should be the last thing on your mind. You want cool, reliable air that you don’t have to think about. HVAC system breakdowns are unexpected and always unwanted. National Heating & Air Conditioning is dedicated to quality AC repair, service and installation throughout Medford & the surrounding areas. We don’t want your home or business to be uncomfortable during the warmest time of year. No matter the time of day or the day of the week, our team of HVAC experts will have you up and running in no time. Whether you need an unexpected AC or furnace repair or you are interested in a new HVAC system, you can count on National Heating & Air Conditioning. Rogue Valley HVAC Service Experts! Our main priority is to ensure that every customer receives high-quality, reliable air conditioning and heating service. We do this by offering services like preventative seasonal maintenance & second opinions on your HVAC system. When you have the experts at National Heating & Air Conditioning perform preventative maintenance your AC or heating system, your unit will be running at peak efficiency & should be trouble free all season long. We strive to deliver award winning heating and cooling services throughout Medford & the surrounding areas. Every one of our HVAC technicians are factory-trained and certified. To learn more about what we can do to get your home as comfortable as possible, give us a call at (541) 535-4687.